Last week we looked at measurement for maths. We had a lot of fun measuring things not by using rulers, but instead using our bodies and other things like blocks. 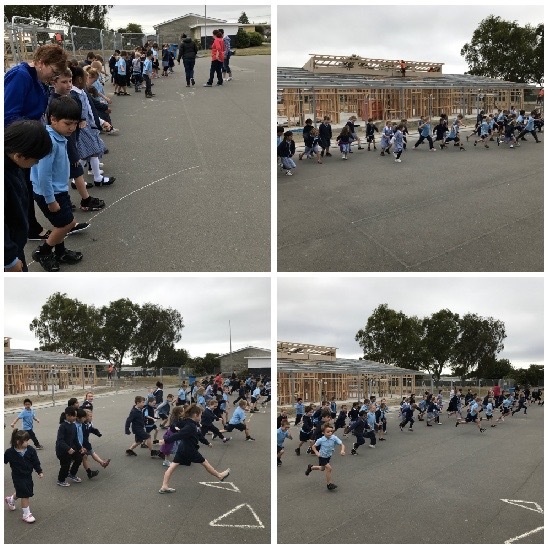 We had lots of fun measuring trees with our arms, everyday classroom items using block, and measuring the court with some BIG ginormous steps and some very teeny tiny steps too! Hey Junior hub, Miss Morgan here. What a cool thing to do! What was your favourite way to measure? This reminds me of a time last year when my class measured the Senior Court with fruit, pencils and chairs! It was fun! I hope you all had fun doing this too! Wow! That sounds fun!!! Are there any other ways that you can measure it? Next time you could put in ways that you could measured the court. I remember Measuring things when I was a bit younger. Hi my name Kristie! I really liked the idea. I never done that ever before so I might do that! Maybe next time you could Talk about why you did it! Wow that sounds cool i like how you have fun with maths but maybe next time more some wow words. WOW I really like how you had four different pitchers. I like how in the third pitcher most of the kids where taking big steps. I think maybe who ever took the photo should zoom in a little bit. I thought it was amazing. Hi Junior Hub I really like how you measure in a different way. I like that you put four pictures!